The Cinderella Collection is your little girl’s dream. 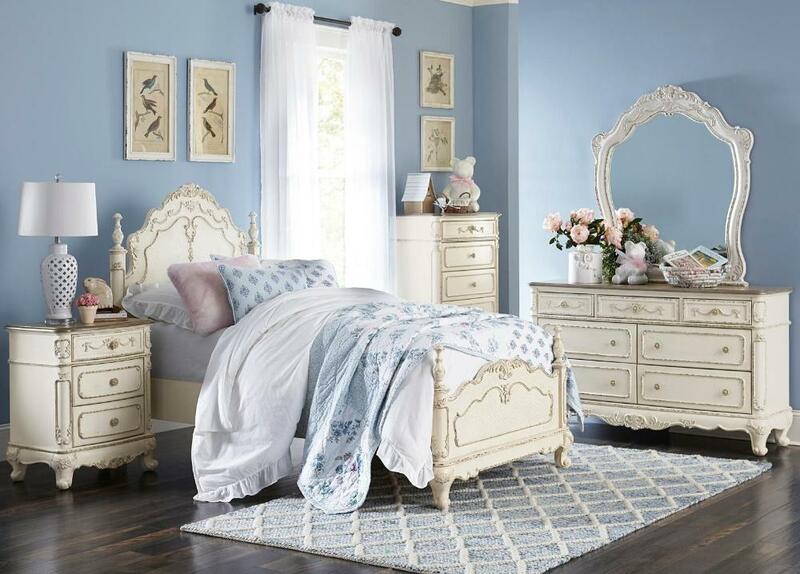 The Victorian styling incorporates floral motif hardware, antique white ecru finish and traditional carving details that will create the feeling of a room worth of a fairy tale princess. A canopy bed completes the fantasy of this whimsical collection. Turned posts reach for the heights and are topped with carved finials. The additional trundle provides the extra sleeping space for princesses visiting from other kingdoms. Also available in dark cherry and newly antique white with grey rub-through finish. FEATURES: Ecru White / Dark Cherry / Antique White Finish ~ Victorian Style ~ Traditional Carving Accents ~ Turned Posts Topped with Carved Finials ~ Floral Motif Hardware ~ Dovetailed Drawers ~ Metal Glide.